As far as the spine is concerned, we start with 33 bones as infants. The bottom 3-5 (variable in every person) fuse to form the coccyx and the 5 bones above the coccyx fuse to form the sacrum. As adults we have 26 bones. The bones get larger as you get toward the bottom, indicative of the weight it needs to support (there’s more weight in your torso than above your shoulders for example.) The curvatures alternate to help with the shock absorption. Primary curves: The thoracic and sacral curves are already in place when you’re born because you have ribs attached to the thoracic. They are called the primary curvatures because they are present at birth. 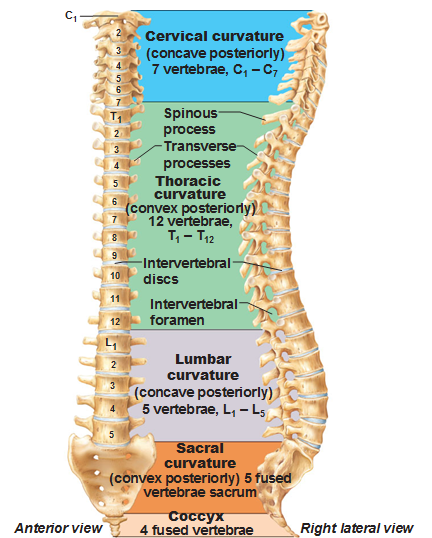 The cervical and lumbar curves are called secondary curvatures because they develop in the first 2 years. When a baby is born they can’t hold up their head. As a baby uses their head, they start to build the cervical muscles attached to their head, so the cervical curve develops. The lumbar curve develops when the baby learns to stand up and balance. The ligaments are what hold the bones together and are made of dense regular connective tissue. The anterior longitudinal ligament prevents you from arching your back too far back (hyperextension) while the posterior longitudinal ligament is a series of short ligaments instead of one long one that prevents hyperflexion, which is you bending forward. 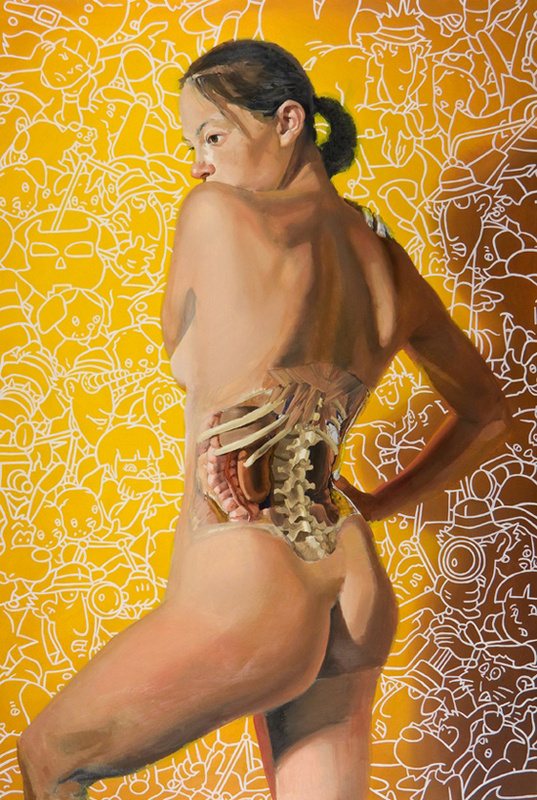 Cushions in between each vertebrae are made of cartilage. The center called the nucleus pulposus is very squishy, very watery. The ring around the disk is called the anulus ring which is fibrocartilage of a dozen concentric rings around the center, which is what you see on a skeleton. When a disk slips, a herniated disk is this fibrocartilage ring that bursts and the bone loses cushioning and the nerves get squished. There’s something with superstitions, such as, dancers are more likely to get injured after a break up, because the emotions correlate with injuries. The spinal cord runs through the vertebral foramen. 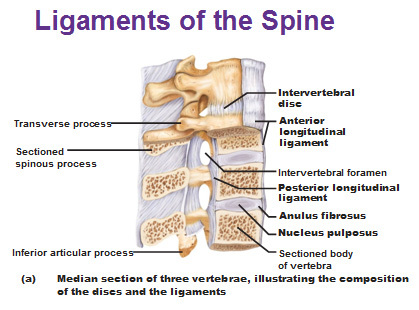 The spinous processes are those things sticking out b/c process means something sticking out. Transverse process are the things that stick out on the sides, hence the word, transverse. 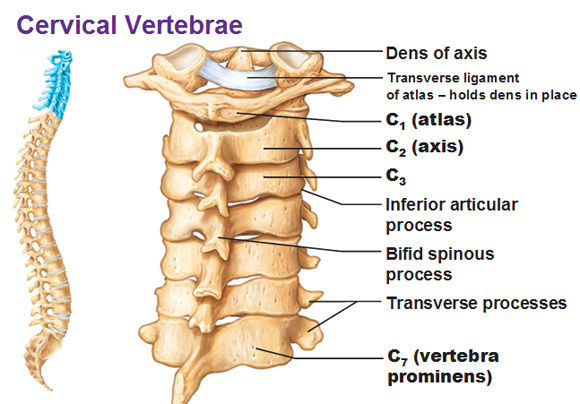 Two pedicles and two lamina are what form the vertebral arch. 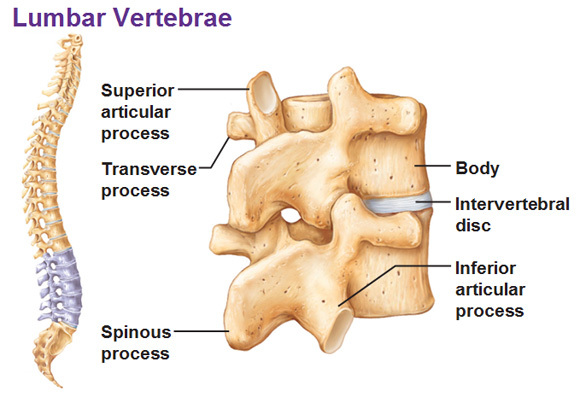 C1, C2 and C7 are very unique compared to the rest of the vertebrae. C1 = The Atlas (The head sits on the Atlas… cause he has to hold the world on his shoulders)… the atlas has a superior articulated facet (facet=smoothed out surface, that articulates with another). The occipital condyles (of the occipital bone) fit into these facets providing extension and flection to nod your head. C7 = Vertebra prominens. This is the bone with the largest spinous process of the cervical vertebrae and is the big bump on your neck that is really obviously when you bend your head forward (flexion). 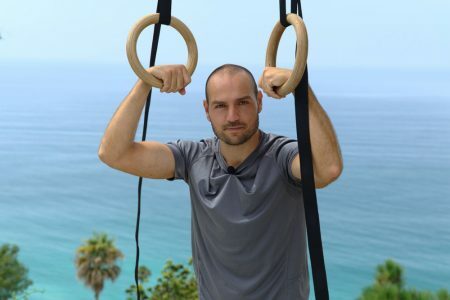 T1-T12 = Have a specific shape, structurally reflecting that they have to hold ribs. 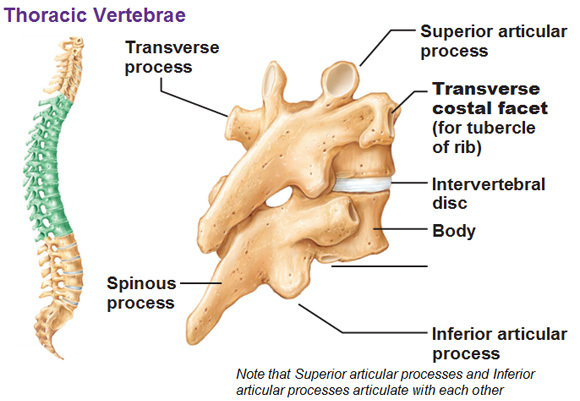 The transverse costal facet is what holds the rib. Costal means rib and facet is a smooth connection. Lumbar: The spinous processes look like hatchets and can be felt. Superior articular facets face posteromedially, and Inferior articular facets face anterolaterally. 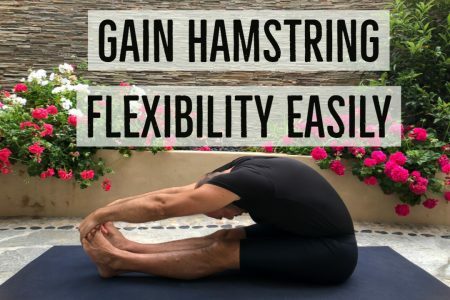 This allows for flexion and extension but limits rotation. Sacrum: Forms the back wall of pelvis. The foramina are what the nerves run through the sacral canal. The apex is the tip of the sacrum. 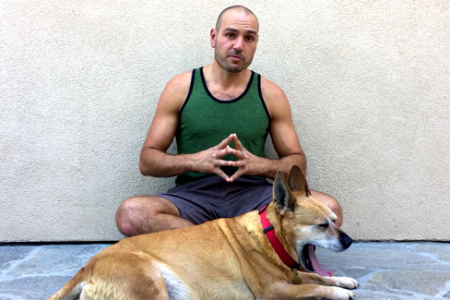 The sacral hiatus is the hole on very bottom. The auricular surface articulates with the hip bones and is shaped like an ear. The median sacral crest is where the spinous processes would be. The transverse ridges sticking out on the anterior side of the sacrum are a result of fusion. 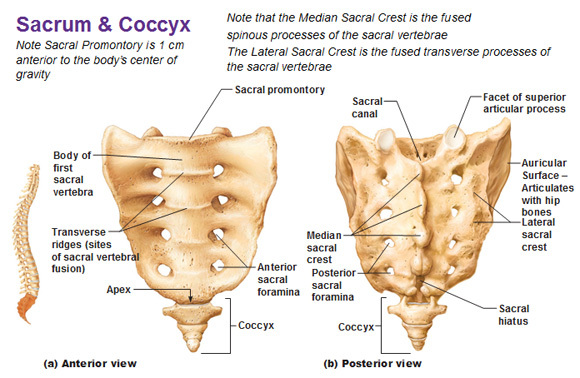 The coccyx is the tail bone. Kyphosis is an exaggeration of the thoracic curve usually due to osteoporosis as there is not enough remodeling and therefore, the bones shrink. 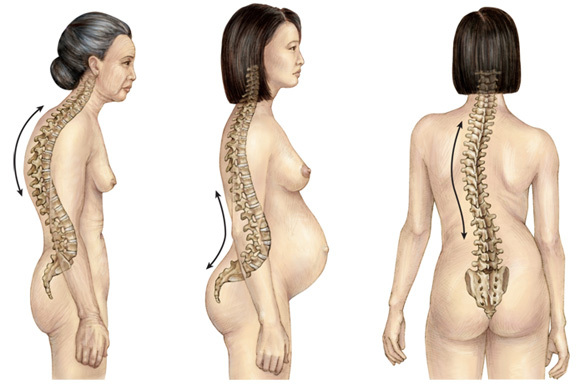 Lordosis is when the lower back (lumbar) curves forward, typical with pregnant or fat people. Scoliosis is a lateral curvature of the spine. Kyphosis on the left. Lordosis in the middle. Scoliosis on the right.